New without box, shelf display item. Bottom soles has light dirt scuffs. Insoles and inner lining are clean. Shoes are in pre-owned condition and shows signs of light wear. Sides of both shoes show light lint. Length (Heel to Toe-Outer soles): 10.75". Anne Klein AK Sport Carly Women's Sz /5 Black/ Patent Leather /Suede. 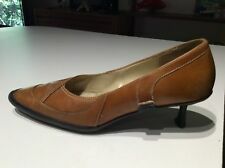 AK Anne Klein GO Tan Leather Dress Pumps Sz Women 9.5 M Comfort soles. New without Box. Beautiful Anne Klein Leather Suede T-Strap High Heels Black Brown Gray, US Women's size 8 M (retails $150). Free usps shipping. Portion of purchase goes to charity so feel good about buying. Thank you! Questions are welcome. 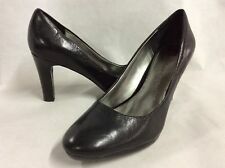 Anne Klein Black Leather Upper Womens Black Heels Dress Pumps Shoes 9 Medium. New item without box. Shipped with USPS Priority Mail. Shoes are in Excellent pre-owned condition. Minor heel tip wear, discoloration in inner sole. See pictures for details. This item is in good pre-owned condition and shows moderate wear from previous use, including: outer sole wear and slight markings, slight scratches and markings, inner sole wear. Heel height is 2". We want to focus on the special abilities of these extraordinary individuals. 2" Kitten Heel. Black Genuine Leather Sling Back. Anne Klein. 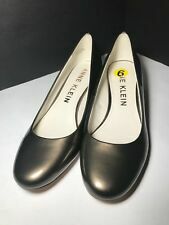 Anne Klein Heels. Final Sale. Photos are actual item. Slingback Strap with Elastic Section. All Man Made Materials. Man Made Sole. Manufacturers'Color:White. Style Number:N/A. New without Bow. Beautiful Anne Klein open toe slip on wedge sandal. Logo in middle of Black flower. Woman’s size: 9. Please view photos provided for measurements and more details.heel is approximately 3”. Please view all the photos and email with any questions, as all sales are Final. No returns.All items are As Is so please email with questions or concerns regarding item before purchasing. Smoke free home. Love to combine shipping. Thank you for viewing and have a blessed day. Dress to impress in the office or during date night in the Expert pump from Anne Klein. These pretty, pointed toe leather slingbacks are finished with a kitten heel for classic appeal. Leather upper. The bottom soles are lightly dirty. Shoes are in pre-owned condition with light wear. Light marks on the sides of the shoes. Heel to Toe: 10". Insoles:10.75". STYLE: Costaro. Anne Klein. Elastic goring on upper. COLOR: Black. Infant's Shoes. 12.5 |13 |13.5. These AK Anne Klein shoes features a peep toe, textile upper, adjustable ankle strap, balance man made, 3.25" width, and a 3.75" heel with 0.5" platform. Slightly worn upper, inner, insole, heel, and sole. Outer ball of foot width: 3.1/8". Elastic on the end of the strap attached on buckle. Scratched leather above the right heel. The outsides of the shoes and the insoles are very clean and show no signs of wear. Length (heel to toe)-10.25". Shoes are like new and in excellent condition. Width-3.25". Heels and toes show lint/dust and scuff marks. Bottom soles are slightly dirty with signs of normal wear. Insoles and inner lining are slightly dirty from use. Bottom Sole Length: 11". Insole Length: 10.5". This is a pre-owned item but is in overall good condition. The item depicted is the item you will receive. AK Anne Klein footwear provides fashion, quality, and comfort at an affordable price point that's perfect for every modern woman's lifestyle. AK Anne Klein iFlex technology allows for a flexible fit that can. Faux Patent Leather Beige Upper. Style Number:AK7WYSTERE / 60193423-9SA. Material: Leather Upper, Balance Man Made. Strap across top of foot is elastic/stretchy. Color: Black. Shoes are in pre-owned condition and show signs of light wear. Heels and toes of both shoes show light dirt. Length (heel to toe)-10.5". AK Anne Klein Slingback Open Toe Sandals Heels Shoes. Shiny Creamy White & Black Patent. All Man Made. Black Florette. Anne Klein - Petrona. New in the Box. Bottom soles are slightly dirty, no wear to treads. Light lint along the sides of shoes. Insoles are clean from gentle use. Shoes are in excellent condition. Insole Length: 11". Length (Heel To Toe): 10.75". 1 Pair No Box Pair By Anne Klein BROWN/TAN Leather Ankle Strap Heels 9M ! (small blue bin mix shoes #50). IN NO WAY DOES THIS EFFECT THE FUNCTIONALITY OF THE ITEM. NOR WILL IT BE SEEN WHILE WEARING. Anne Klein iFlex 'Akouray' Strappy Heels. Black snake print type embossed leather. Length (heel to toe)-11". Shoes are like new and in excellent condition. Insoles-11". Width-3.5".